Auto pay can be selected at the time of application. If you choose this payment method after the application process has been completed, you will need to write a letter stating how you would like the payment deducted from your checking account. The letter needs to be specific to the payment amount and needs to be signed and faxed to (866) 912-3704. The prime rate is the index used to calculate the interest rates on variable rate accounts. For each billing cycle, variable APRs are calculated by adding a specified amount ("spread") to the U.S. prime rate published in the money rates table of The Wall Street Journal that is in effect on the last day of the month ("prime rate”). 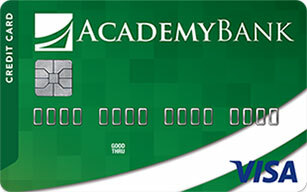 Secured cards are credit cards that require a savings account to be established as collateral for the credit card. They are an excellent way to establish a positive credit history and are designed especially for people who have no credit history or who have experienced past credit problems. How is a secured card different than a prepaid card? How They Are Alike - Both secured credit cards and prepaid cards require you to deposit money before you can use them. Both can be used at places like grocery stores, gas pumps, etc. to make purchases. How They Are Different - A secured credit card requires you to make a security deposit against the credit limit before you can be approved for the card. Your security deposit is placed in a savings account and kept there until your card is converted to an unsecured credit card or until you close the account. Secured credit cards work much like regular credit cards. Secured cardholders are responsible for timely payments, just like regular cardholders. This is a good thing because it teaches good repayment habits and helps to establish a positive payment history, which is a very important part of establishing or rebuilding credit. Purchases made with a secured credit card go against your revolving credit limit. When you pay off your credit card balance, your available credit goes up again, just like a regular credit card. The security deposit is required because you're a more risky borrower. Prepaid cards are different. There's no credit limit for a prepaid card. You make a deposit onto the card and it goes into an account. When you use the card for purchases, the balance is deducted from your balance. Once you spend your deposit, you must redeposit money before you can spend again.